Mosul's Great Mosque of al-Nuri was destroyed in June 2017 by ISIS as government forces closed in on the city. The United Arab Emirates will contribute $50.4 million to restore the mosque and other cultural landmarks. Iraqi forces and civilians stand inside the al-Nuri mosque in the Old City of Mosul in January 2018, six months after troops took back the city from ISIS. 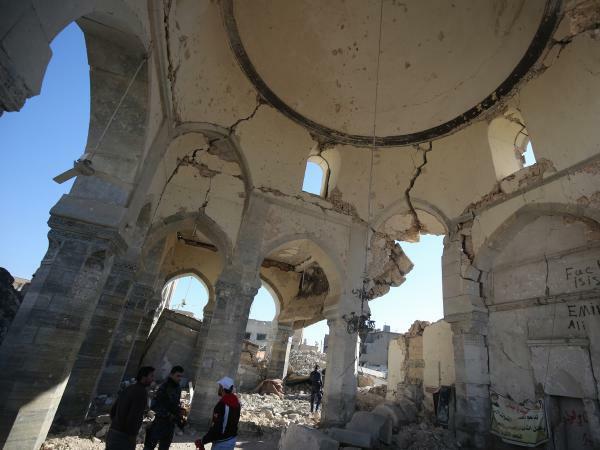 The United Arab Emirates will contribute $50.4 million to rebuild a mosque and cherished leaning minaret that were destroyed after the Iraqi city of Mosul was overrun by the Islamic State. On Monday the UAE, Iraq and the United Nations signed an agreement that Audrey Azoulay, director-general of the U.N.'s cultural agency UNESCO, called "a historic partnership." In a written statement, she said it was "the largest and [most] unprecedented cooperation to rebuild cultural heritage in Iraq ever." The Great Mosque of al-Nuri was built in the 12th century inside Mosul's Old City. It was named after Nur al-Din Mahmoud Zangi, a Turkic ruler who unified Muslim forces during the Crusades. In July 2014, ISIS leader Abu Bakr al-Baghdadi stood at the mosque's pulpit and declared Iraq and Syria as the terrorist group's "caliphate." As Iraqi security forces drew closer to Mosul in June 2017, ISIS destroyed the structure and later used the explosion as propaganda, pinning the damage on a U.S.-led coalition airstrike. "Jihadist supporters are using it to blame the West and Americans," Alberto Fernandez, then-vice president of the Middle East Media Research Institute, told USA Today. 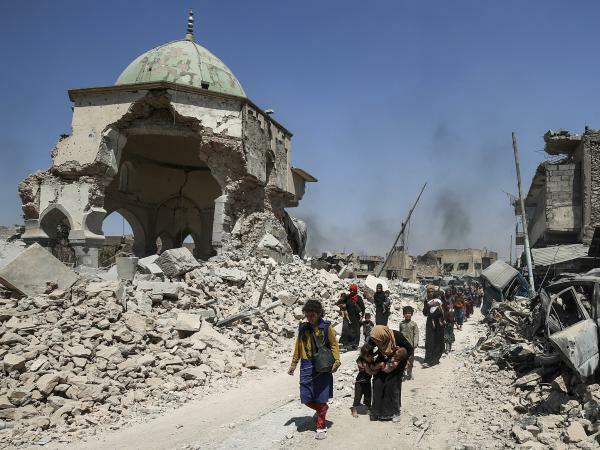 Months after Mosul was liberated, the bodies of ISIS fighters still lay in the rubble near the mosque, NPR's Jane Arraf reported in March. Thousands of homes in the city's historic section were in ruins. and people had no electricity or running water. Only a stump-like remnant remained of the famously tilted minaret known as al-Hadba, or the "hunchback." "We need services," a Health Ministry employee told Arraf. "They just need to take away the rubble. We need water tankers to come so we can drink clean water. If they get rid of the rubble and repair the streets, a man can rebuild with his own hands." The Iraqi government has estimated that a minimum of $2 billion is needed to repair crumbling streets and homes. The UAE funding is earmarked for restoring the cultural landmarks. But Louise Haxthausen, director of UNESCO's Baghdad office, told NPR that the $50.4 million will still help the city. "It will generate employment and allow the inhabitants to develop and acquire skills," she said. But some Mosul residents pointed to other, more pressing needs. One teacher and photographer tweeted an appeal to "please remove the rotten bodies first." With a five-year timeline, the first year of the restoration will focus on clearing debris from the site, documenting items and drawing out details for reconstruction. The next four years will focus on the restoration of the mosque and surrounding buildings. The reconstruction will preserve "the original minaret with its distinctive hunchback lean," Haxthausen said. A joint committee will supervise the rebuilding efforts, including members of the Emirati and Iraqi Ministries of Culture, UNESCO and the Iraqi Sunni Endowment, according to the Emirates News Agency. Haxthausen said the restoration is a key part of a flagship UNESCO initiative called Reviving the Spirit of Mosul, which launched in February, to "bring life back to the city." The UAE and other Gulf countries have recently improved relations with Iraq, Arraf notes. Arab Gulf leaders for years refused to recognize Iraq's Shiite-led government as legitimate.